GNITION COIL A good deal of confusion surrounds the subject of ignition coils in cars with positive earth systems. In this chapter I argue, with some diffidence, that the conventional wisdom is wrong, that a number of papers which I believe are poorly researched and misleading have been printed and disseminated, and, worse, believed, and that the errors have been reproduced and reprinted so many times that they have acquired the patina of truth. I am aware of the dangers of contradicting the dominant paradigm, because "Where no counsel is, the people fall; but in the multitude of counsellors there is safety" (Proverbs 11:14 KJV). On the other hand, "The simple believeth every word; but the prudent man looketh well to his going" (Proverbs 14:15 KJV). Moreover, "There is nothing so absurd that it cannot be believed as truth if repeated often enough" (William James 1842-1910), and "The fact that an opinion has been widely held is no evidence whatever that it is not utterly absurd; indeed in view of the silliness of the majority of mankind, a widely spread belief is more likely to be foolish than sensible" (Bertrand Russell, 1872-1970) . These sentiments have been verified experimentally in scholarly works: have a look at Solomon Asch's work on conformity, and Hasher and Goldstein's work on how the repetition of more or less plausible statements affects one's judgement of their truth and validity. This diagram shows the two possibilities for connecting a coil marked + and - to a positive earth system. The first diagram shows the + terminal connected to the live negative battery via the ignition switch, and the second shows the opposite. The obvious difference is the direction of current flow in the primary, which will give a spark of the opposite polarity. Long ago, when I first wondered about the mysteries of Kettering ignition systems and coils (inductive discharge ignition systems were invented in 1910 by Charles Kettering of Dayton Engineering Laboratories Company - DELCO - and first used on Cadillacs), some cars had positive earth systems and some had negative. All coils were marked SW and CB: SW went to the battery via the ignition switch, and CB went to earth via the contact breakers. Easy. They didn't have separate coils for +ve or -ve earth, and it didn't matter whether you had positive or negative earth: you bought your coil, and you wired SW to battery via the switch, and CB to earth via the contact breaker. If you had a positive earth, the current in the primary went one way, and if you had negative earth, it went the other way. It didn't matter. What did matter was how the internal windings of the coil were connected relative to the battery and contact breakers. Nowadays, although some cars, mostly British classics like MGs, still have positive earth, almost all cars have negative earth, and instead of ignition switches and contact breakers they have things called engine management systems. If the coils were still marked SW and CB, the engineers wouldn't know how to connect them, so to make it easy for them modern coils are simply marked + and -. All the manufacturers have done is replace the SW symbol with +, and the CB with -. This has lead to the confusion that exists for those of us who still have cars with positive earth (see eg mgaguru's 2009 paper and about 1000 others). When I went to buy my new coil, I was told by everyone either that it didn't matter how it was connected, or that the - terminal should go to the negative battery terminal via the ignition switch and the + terminal should go to ground via the contact breaker. Unanimously. But they were wrong: if it didn't matter, the manufacturers wouldn't have bothered to mark the coils at all, either with + and -, or with SW and CB. There is clearly a difference, and you can see the difference by drawing the wiring inside and outside the coil, and consider how it would look if it were connected firstly + to earth, and then - to earth. (In this diagram, the battery is always connected positive to earth, and the + and - refer to the markings on the coil, and the red arrows show the direction of conventional current in the primary.) If you wire it one way, the current in the primary goes in one direction, and if you wire it the other way, the current is reversed. In one case, when the spark forms electrons flow from the HT lead, and in the other, when it forms, electrons flow towards the HT lead (in his paper, mgaguru describes a test with a graphite pencil, which he concedes is hard to interpret, to decide which way the electrons are flowing. I came across references to the same test in a few places (eg http://www.dansmc.com/polarity.jpg, none of them attributing the reference to another). Conventional wisdom is that you want a negative going high tension pulse - ie you want the spark to be initiated by electrons flowing from the HT lead - because the initial spark is supposed to be caused by electrons, and they are supposed to flow more easily from the hot centre electrode to the cooler surrounding earth. You can find many references to this, none of them giving a reference to support the assertion - mgaguru's paper is one example. I was initially attracted to this idea. But search as I would, the only explanation I could find for electron emission from a hot surface was the so-called thermionic effect, which was discovered in 1873 by Frederick Guthrie in Britain, developed into a patentable device by Thomas Edison in 1883, and finally explained by the British physicist Owen Richardson in 1901, for which he received the Nobel prize in 1928. Thermionic emission arises because some of free electrons which exist inside all conductors will have more energy than others, and, under some conditions, some will even have enough energy to escape from the conductor altogether. The energy required is called the work function. If the conductor is heated, more electrons may have energy that approaches the work function, but in most cases, the work function is prohibitively high, preventing this from happening. For example, for ordinary metals (eg tungsten, whose work function is 4.5 eV) the thermionic effect does not begin until about 2500 deg k (2200degC) - bright white hot. For nickel, commonly used as the centre electrode in spark plugs, the work function is even higher, at 4.6 eV. Alternatively, the conductor can be treated to lower the work function. Thermionic emission is the basis for operation of thermionic valves, such as those used in expensive valve-operated hi-fi amplifiers. The cathodes in thermionic valves have been coated with a metal oxide, usually barium oxide, to reduce the work function; even so, the thermionic effect is not significant for temperatures less than about 900-1000degC (bright red hot), which is why the valves glow red hot. Spark plugs are not so coated. The operating temperature for plugs is typically in the range 450 - 870 deg C, well below red hot, well below the temperature at which the thermionic effect is significant, even for coated surfaces. The fact that the car starts even on cold winter mornings should tell us that the thermionic effect is not a factor in initiating the spark. In fact, the spark is initiated by plasma, formed when the electric field exceeds the so-called Dielectric Breakdown Strength, which is when the field is strong enough to strip electrons from the atoms and molecules in the mixture. The polarity of the field is not important. It is only the field strength that matters: whether positive or negative, the field will be strongest near the centre electrode, where field lines will be more concentrated (this is very much like lightning, where the spark is caused by dielectric breakdown of air, and where, like our spark plugs, the field is strongest near the tip of a lightning conductor). In other words, the spark is not initiated by electrons flowing to the central electrode, or from it; it doesn't matter whether whether the HT electrode on the coil is initially positive or negative. From consideration only the initiation of the spark, it doesn't matter which direction the current flows in the primary coil. Well then, is there something else which is important? The capacitor (or condenser) is important. When the capacitor fails it almost always gives an open circuit. In that case, the energy in the primary is dissipated in a spark either at the points or elsewhere, instead of in the secondary. (Steve Maas has used the technical resources available to him to show that the capacitors usually fail internally due to poor construction. As an experiment, you can try disconnecting it: the spark will be weak and thin, and will not fire the mixture under load. This is the reason for the problem I described earlier in the context of overheating). When the contact breaker points are opened, the primary circuit transforms into a simple series/parallel resonant circuit. If the - terminal on the coil is connected to earth (via the contact breaker) it gives the parallel tuned circuit shown. The opposite connection (+ terminal on the coil connected to ground via the contact breaker) gives the series tuned circuit shown in the right hand image. Note that this is true whether the car has a positive or negative ground, but, as before, I am considering here the case of positive earth. At the resonant frequencies involved, the battery is effectively a short-circuit: consequently I have represented it here as a dotted line, and have marked the positive and negative polarity and direction of conventional current. These images were found in a later paper by mgaguru, who has thereby partially redeemed himself in my eyes. Note that the sketch appears to show a coil with conventional -ve earth, since the current during the 70% dwell time (when the points are closed) is positive, as is the voltage at the points during the 30% of the cycle time when the points are open. MGAs still had positive earth systems, so, if these pictures came from his own systems, mgaguru must have converted his car to -ve earth. It takes only about 10-14kv to fire the mixture under operating conditions. 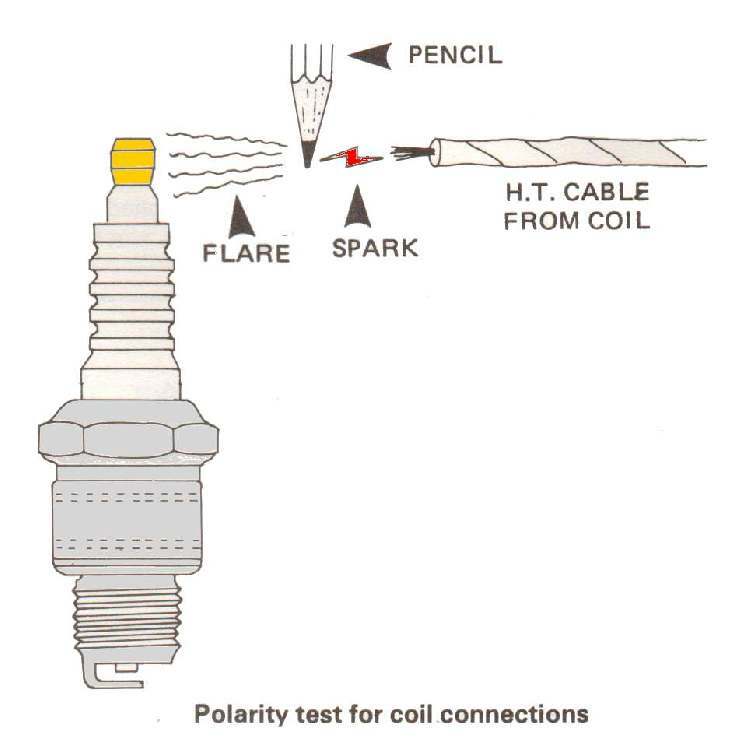 Once the spark is struck, its polarity doesn't matter, and it makes at least a few cycles of alternately positive and negative excursions before the energy initially stored in the coil's primary is dissipated. (This would explain why the graphite pencil test described in mgaguru's first paper is hard to interpret, since during one excursion electrons will be flowing in one direction, but in the next they will be flowing in the opposite direction: in one excursion the flare will be between the pencil and ground, and in the next, between the pencil and the HT lead. The excursions are so rapid that it looks as though the flare is going both ways.) 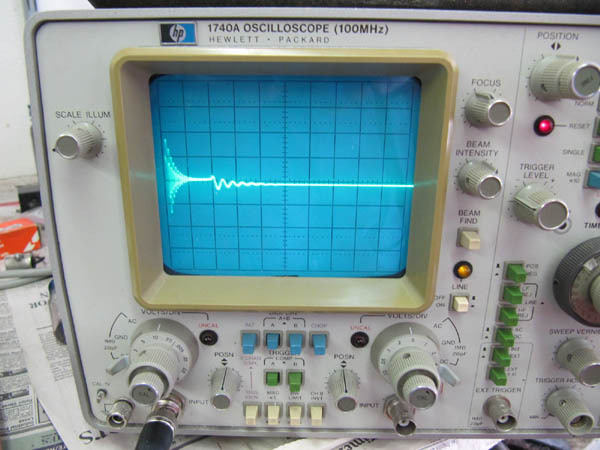 This oscilloscope trace shows the ringing when the points open, causing the spark; the second, lesser, ringing is when they close again, to allow the current to build up in the primary. In the sketch above this secondary ringing is not shown when the points close. Other images and discussion can be found easily; the image on the right comes from Steve Maas's paper, referenced earlier. And although it's commercially driven, this one is a good resource. See also this thesis which was prepared for a MSc degree. So, parallel or series connection: which is correct? I have long ago forgotten all my circuit theory, but I thought that the manufacturers of the coils would probably know, and would have a preference. They probably expected the + terminal to be connected to the battery, which as we've seen is almost always positive these days, and the - to ground. That meant that they wanted or expected the parallel circuit as shown in A above. And also, of course, the + corresponded to the old SW, and in the old days of SW and CB, connecting the SW to battery would have resulted in the parallel circuit for both positive and negative earth systems, with a negative-going pulse in the case of negative earth systems, or a positive-going pulse in the case of positive earth systems. So in my case, that meant connecting the + terminal on the coil to the - terminal on the battery, via the ignition switch of course, and the - terminal to ground via the contact breaker. So that's what I did. The car works well, and any remaining problems must be due to some other cause. We will see.